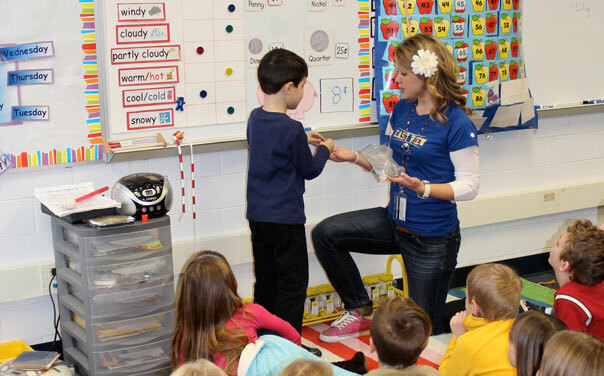 AU senior elementary education major Tiffany Stallman interacts with a student in her classroom at East View Kindergarten Center in Oswego, where she is a student teacher. My love for education and learning was nurtured by my grandfather. He thought being a teacher was a wonderful job and always told me, “Knowledge is the gift that no one can take away from you.” He is also one of the reasons I chose to come to Aurora University, as he was a 1963 graduate of Aurora College. I am happy to say that AU has helped make my dream of becoming a teacher a reality. The methods experiences and education courses here helped me grow into the teacher I am today. One of the greatest things about AU is that you get real classroom experience, so you get to practice your lessons with real students, not just the peers in your classroom. The AU College of Education professors are also amazing. Their passion for teaching truly shines. The greatest experience at AU was the clinical immersion program. I was placed in Oswego School District 308, where I taught whole group lessons and small group interventions, as well as conducted assessments. I had wonderful and supportive cooperating teachers who taught me so much about the kindergarten and first-grade classroom environment. From that experience, I also got a student teaching placement. I am currently student teaching at East View Kindergarten Center in District 308 with the cooperating teacher I worked with through clinical immersion. She is more amazing than you could imagine, acts as a wonderful mentor, and has many great ideas and suggestions. The first day, I was not nervous as you may expect; I was confident and excited. The courses and professors at AU truly prepared me. I learn something new each and every day, especially about classroom management. With a room full of 25 kindergarten students, exceptional classroom management is necessary if you want to get anything accomplished. Student teaching has been incredibly rewarding so far. In what other profession would you get this asked of you on a foggy day: “Are we going to bump into each other at recess?” Or in what other profession would someone whisper in your ear, “I love you so much. You are the best teacher in the world.” Each day brings about a new challenge; however, the little “aha” moments make overcoming all the obstacles of teaching well worth it. Choosing to become a teacher and pursue this dream at Aurora University were two of my three best life decisions. If you must ask, the third it is the choice to marry my high school sweetheart. Tiffany Stallman is a senior elementary education major from Oswego, Ill.